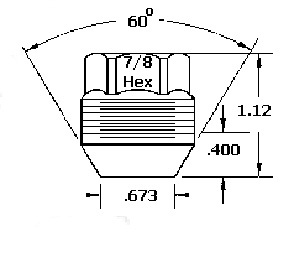 Special GM OEM style 14mmx1.50 lug nuts with external threads. These lug nuts fit 1988-on Chevy full size pickup/truck , Suburban, etc. They are used to accept screw on newer decorative covers or caps onto the older GM trucks and vans which have 14mm thread stud. Our application guide page will answer most of your application fitment questions but ask us for unanswered question. Sold in each piece.